My spiritual master, Avatar Meher Baba, dropped His body on January 31, 1969. Every year on this date, thousands gather at Baba's Tomb-Shrine (also known as the Samadhi) on Meherabad Hill in India for a celebration—not just to remember Baba, but to experience His presence and His love. 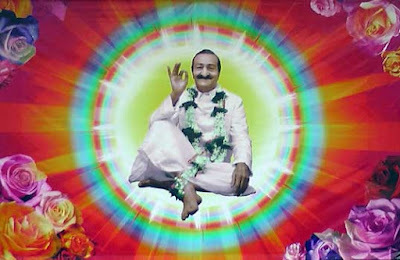 The Amartithi (meaning "eternal date") festivities climax with fifteen minutes of silence outside the Samadhi, beginning at 12:15 in the afternoon, the exact time Avatar Meher Baba shed his physical form. The one time I attended Amartithi, in January of 1990, I was lucky enough to spend those fifteen minutes just outside the Tomb, sitting on the ground with my head pressed against the cool stone. The power of that silence, of Meher Baba within that silence, was so profound, so sacred and magical, that words could never capture it. It bypassed the mind and ran straight to the deeps of the soul. The other day I had a long conversation with John Siuntres for his wonderful Word Balloon podcast. We covered Batman: Bad Blood, the new Augusta Wind series, Justice League 3001 and lots of other things. It was, as always, a genuine pleasure talking with John. Click here to listen. Hope you enjoy it! With the ballyhoo (there's a word you don't hear very often) surrounding The Beatles' recent, wildly-successful, debut on various streaming services, I thought this would be a good opportunity (perhaps excuse is a better word) to indulge my Beatles-obsession and revisit my list of top twenty Beatles tracks, originally presented here back in 2009. A word of warning: these are my top twenty selections today (the numerical order is almost irrelevant. Any one of these songs could be number one). The Beatles treasure chest is so deep, and filled with so many musical jewels, that I could probably compile another list, with twenty different songs, tomorrow. Their first number one single. As fresh, as exciting, as filled with humor and energy, as anything that followed. Right out of the gate John Lennon proved he had one of the greatest voices in rock and roll. And he kept getting better. As honest, and emotionally naked, a song as the Beatles ever recorded. No surprise that the wounded, desperate voice at the center of the song is Lennon’s. “Don’t Let Me Down” provides the blueprint for much of John’s solo career: autobiography, straight from the heart. 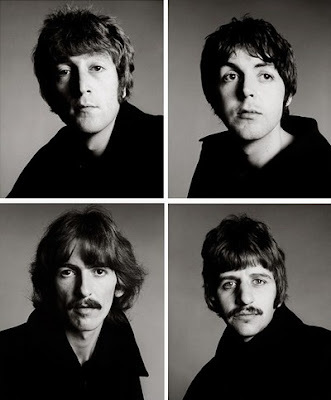 “Come Together” isn’t the greatest Beatles song, but it’s one of the most brilliant recordings the band ever made. Abbey Road may have been the group’s last album—with tensions high and everyone pretty much desperate to get out—but you’d never know it from the way they played together on this track. McCartney’s bass and Ringo’s drums alone are worth the price of admission, with Harrison’s guitar work not far behind—and it’s all topped with a snaky Lennon vocal that manages to be as inspiring as it is sinister. But the real hero here may be producer George Martin, who gives the track an incredible polish, without ever obscuring the song’s down and dirty roots. According to myth, John was the acerbic rocker and Paul was the melodic, tender-hearted balladeer. In reality, McCartney was one of rock’s great screamers and Lennon’s hard shell masked an incredibly soft center. Here John offers up one of his most beautiful, and honest, love songs—with Paul'’s harmony offering perfect support. I still remember hearing this come over the radio in 1965. It didn’t sound like any other Beatles song I’d ever heard—especially the middle section, with that funereal harmonium pumping away and Lennon and McCartney—sounding more desperate and anxious than two rich, happy rock stars should—telling us all that life was very short and there was no time for fussing and fighting. The Beatles were clearly changing and that fact was as thrilling as it was disturbing. Psychedelia went into labor with “Rain,” but it was born with this extraordinary track: Lennon channeling Timothy Leary channeling The Tibetan Book of the Dead. “Lay down all thought, surrender to the void...it is shining, it is shining...” Still great advice, if you ask me. The essence of Beatlemania—all the joy and wit, euphoria and lunacy—boiled down to two minutes and thirty-three seconds. Once again Lennon and McCartney are in perfect balance—you could write an entire book about the blending of those two incredible voices—and it all kicks off with a glorious opening chord that musicologists are still dissecting. There are some who dismiss this song as so much hippie claptrap. Me, I’m of the opinion that it’s one of the wisest, truest songs ever written. The message is so clear a three year old could understand it, but listen to the lyrics and they open up a whole universe of meaning. Not a hint of claptrap to be found. As perfect a love song as has ever been written. If McCartney had retired immediately after recording this, his place in the songwriter’s hall of fame would still be secure. John Lennon saw this strange, tortuous collision of imagery, angst and varying musical styles as a mini-history of rock and roll—and it certainly is that. It’s also one of the oddest, most disturbing and exhilarating songs in the Beatles catalogue. A journey down the rabbit hole that was the Mind of Lennon, “Happiness Is A Warm Gun” is, even after forty seven years, a continual revelation. McCartney at his most soulful and introspective. The album version, produced by Phil Spector, is a bad mix, with the drums clomping all over the place, the lead guitar noisily intruding and poor Paul stranded in the middle. The single version, produced by the impeccable and brilliant George Martin, is in perfect balance. A gorgeous melody, a flawless lyric, and a performance as honest as any McCartney—who sometimes hides his art behind artifice—has ever given. This is the song “Yesterday” wishes it could be. For years McCartney claimed that Lennon wrote all the lyrics while he supplied the melody. Then Paul changed his story, claiming that he actually co-wrote the lyrics with Lennon. Lennon insisted that he wrote all the lyrics and most of the music, with Paul helping out with the melody. I tend to believe Lennon, who spoke about this song with great passion, and in great detail, during his last interviews; but, however “In My Life” was composed, this Rubber Soul track remains one of the Beatles’ greatest achievements. It’s not surprising that a Mojo magazine panel of professional songwriters selected it as the greatest pop song of the twentieth century. One of the (many) wonderful thing about the Beatles is the fact that their songs evolve in the listening, the tracks continually revealing new layers and levels, and, because of that, “Across The Universe”—a cosmic cry from John Lennon’s heart—grows closer to my heart every year. There have been several different versions released, but the version on the otherwise unnecessary Let It Be...Naked brings out all the song’s magic and transcendence. No wonder NASA beamed it into space. A surreal, psychedelic masterpiece—with a fierce Lennon vocal (there’s some raw anger beneath the druggy haze) and insanely brilliant George Martin orchestration that perfectly matches John’s equally insane, and equally brilliant, lyrics. Paul McCartney at the peak of his powers, leading his band-mates through a memorable finale that manages to wrap up not just one of the Beatles finest albums—Abbey Road—but their entire astonishing career. Optimism, cosmic consciousness, shimmering guitars and gorgeous harmonies entwine in George Harrison’s greatest Beatles-era composition: the best Lennon-McCartney song that John and Paul never wrote. Lennon’s vocal is one of the most magnificent in the history of popular music—so cold, it’s hot; so emotionally removed that it becomes extraordinarily intimate—and the collision of John’s cosmic alienation with Paul’s down-to-earth everyman persona detonates an ending that Lennon, accurately, described to producer George Martin as “a tremendous build-up from nothing up to something absolutely like the end of the world.” Yes, Sgt. Pepper is brilliant, a work of genius and blahblahblah—but it’s also the most over-rated album in the Beatles catalogue. (For my money, Rubber Soul, A Hard Day’s Night, Abbey Road and The White Album are all superior efforts.) “A Day In The Life” is the place where 60’s mythology and musical reality meet. When I was a teenager, lost in adolescent angst and misery, I’d sit for hours feeding my dour mood, listening to the most depressing music in my collection. Then, when I was ready to get over myself, I’d put on “Hey Jude” and, instantly, hope was back. The song is honest, heartfelt and, by the end, downright majestic. A brilliant, moving—and utterly unpretentious—work of art. My latest animation project, Batman: Bad Blood—the sequel to last year's Batman vs. Robin—will be available for digital download this week (the 19th to be precise). The DVD will follow on February 2nd. Here's a new clip to whet your appetite. Enjoy! The movie was directed by Jay Olivia and once again stars Jason O'Mara as Batman, Stuart Allan as Robin and Sean Maher as Nightwing. So ends today's shameless plug!